Duo Rock 'n' Roll US formé en 1951 à New Orleans (Louisiane). Shirley Goodman (née le 19 Juin 1936 à New Orleans (Louisiane)) & Leonard Lee (né le 29 Juin 1936) étaient surnommés les "Sweethearts Of The Blues" et conservaient sur disque un côté enfantin qui a faisait mouche dans les collèges et les lycées. Shirley & Lee se sont séparés en 1963. Lee est décédé le 23 Octobre 1976 et Shirley est décédée le 5 Juillet 2005. 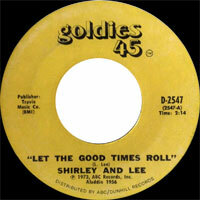 Shirley Goodman and Leonard Lee, born just ten days apart in 1936, scored three massive R&B hits before either one of them were both 20 years old: "Feel So Good," "Let the Good Times Roll," and "I Feel Good" were all written by the talented young couple. They had one trait in common among their recordings; this New Orleans-based duo almost never sang in harmony, let alone together at all. Their contrasting male-female duo style was later influential on early ska and reggae productions from Jamaica. 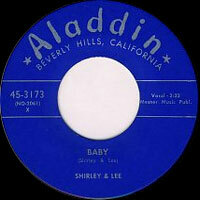 Shirley & Lee recorded extensively for Eddie Messner and Leo Messner's L.A.-based Aladdin label. The Messners — along with former NBC radio exec. Lew Chudd's Imperial Records and Art Rupe's Specialty — seemed to have a knack for signing talent straight out of the Crescent City. 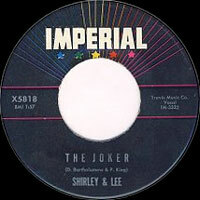 Shirley & Lee's debut single, "I'm Gone," was written and produced by Dave Bartholomew, Imperial's writer/arranger/producer/A&R man and a major contributor to New Orleans-style R&B. (It was Bartholomew's production work with Fats Domino which utilized that talents of a great house band — pianist Allen Toussaint, bassist Frank Fields, drummer Earl Palmer, and saxophonists Lee Allen, Red Tyler, and Herb Hardesty — that elevated nearly everything he worked on to "legendary" status.) 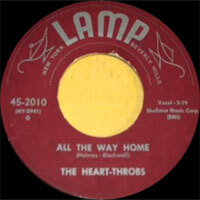 With their backing "I'm Gone" went on to become a major R&B hit in the fall of 1952. Early in their careers, Shirley & Lee became known as "the Sweethearts of the Blues," a nickname given not for their personal relationship, but for their romantic sagas of their songs, which often bordered on telling a fictional soap-opera storyline about two lovers. Their fans would buy the singles simply to keep up with the continuing story of the two sweethearts. The story continued with the very next single, "Shirley Come Back to Me," a heartbreaker released in early 1953, followed by "Shirley's Back," later that year. This happy theme continued through the happy ending for the next single, "The Proposal" b/w "Two Happy People." By the end of the year, Aladdin was reveling in success of the story of Shirley & Lee. 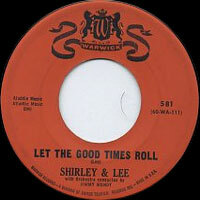 Of course, the couple in the songs had already been apart and were now back together, so they had to shake things up with the next release, called "Lee Goofed," and followed that with "Confessin'" but by now the audience seemed to be tiring of the soap opera, so Shirley & Lee moved on to new lyrical subject matter. Messner decided to try something new for the duo in May of 1955, issuing a medium-tempo rocker called "Feel So Good." The song featured full Vocals group backup (reportedly by the Spiders) and did well, but it was the bluesy B-side, "You'd Be Thinking of Me," that put the duo back on the R&B hit charts. "Lee's Dream" also charted. In early 1956, Aladdin released the duo's slow blues ballad, "A Little Word," which received good airplay, but sales weren't spectacular. 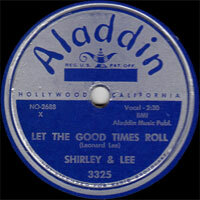 Trying to get back on track, Aladdin finally opted to issue a full-length album, Let the Good Times Roll, in December. It was reissued two years later on Score, Aladdin's budget label. 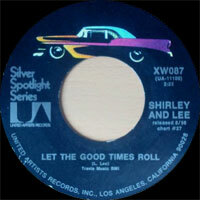 By the middle of 1957, Shirley & Lee were back on top, this time with the biggest hit in their careers. Goodman and Lee borrowed one of New Orleans' most familiar refrains and built a rocking tune around it called "Let the Good Times Roll." The recording was an instant smash and received substantial airplay, climbing up the charts in the process. It sold well-over one million copies and for more than 40 years has been a staple of oldies play lists. To date, there are over a hundred cover versions of the song, but most still prefer the original. 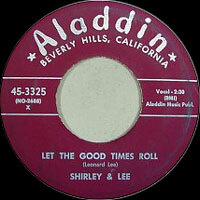 The pair stayed on Aladdin into 1959 before moving to Warwick, where they ended up re-recording "Let the Good Times Roll." 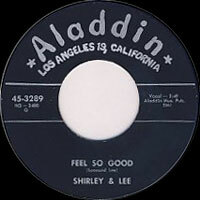 Other tunes followed — "I Feel Good" and "The Flirt" among them — but like many acts, Shirley & Lee were never able to recapture the nationwide success of their biggest hit. After a few final singles in 1962-1963, this time for Imperial — Aladdin and Imperial continued their rivalry and tried to one-up each other until Aladdin was acquired by Imperial outright — the "Sweethearts of the Blues" decided to call it a day. 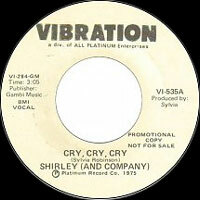 In 1974, Shirley Goodman reappeared on the R&B scene, this time paired with studio musicians — they called themselves Shirley and Company — for "Shame, Shame, Shame," released on the Vibration label. (The song also featured Jesus Alvarez supplying lead Vocalss). The disco-fied hit topped the R&B charts at number one that summer and peaked at number 12 on the pop charts. It was written by producer Sylvia Robinson, who had also been part of a successful '50s duo, Mickey & Sylvia, with Mickey Baker. Robinson also penned Goodman's less successful follow-up "Cry, Cry, Cry." They issued one more single on Vibration, then dropped out of sight. Leonard Lee passed away on October 23, 1976. 1969 SP GOOD OLD GOLD GOG- 001 (US) .